We are local roofers based in Northampton and have extensive knowledge of local roofs and roofing problems, from minor roof repairs such as slipped slates or tiles to all major repairs and maintenance works. We will try to keep your roof repair costs to a minimum, unlike many roofing companies, we will repair roofs whenever possible rather than simply recommend a complete re-roof which could cost you thousands of pounds. 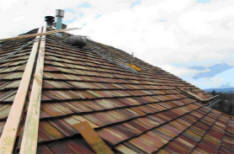 Fixing a leaking or damages roof when the problem first arises can often prevent much more extensive damage occuring both outside and inside your property.